COMSTOCK PARK, MI - Sunday's scheduled ballgame between the West Michigan Whitecaps and Great Lakes Loons at Fifth Third Ballpark has been postponed due to inclement weather. With Great Lakes scheduled for a return to Fifth Third Ballpark in May, Sunday game will be rescheduled during when the Loons visit West Michigan for a four-game series May 16-19, with the day and time to be determined. 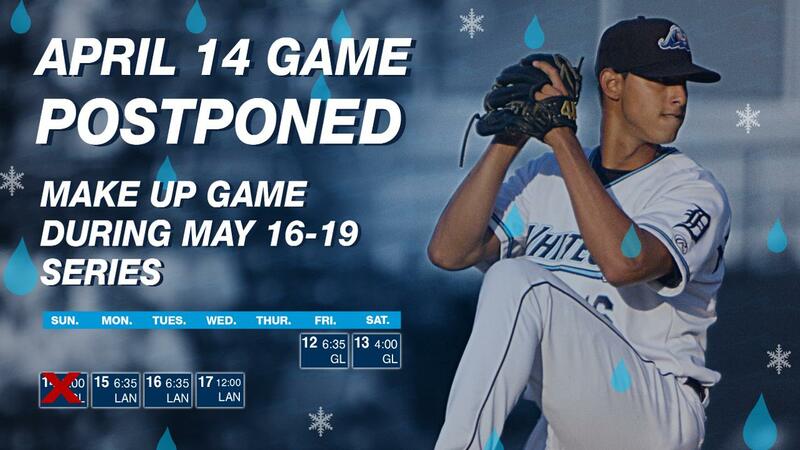 This marks the first time the Whitecaps have had a game postponed during the 2019 season. The Whitecaps bring their in-state rival Lansing Lugnuts to Fifth Third Ballpark for a three-game series beginning Monday at 6:35 pm. Pitcher Garrett Hill makes the start for West Michigan against Lugnuts pitcher Joey Murray. Broadcast coverage with Dan Hasty and Mike Coleman starts on the Whitecaps Baseball Network at 6:25 pm. Tickets are available for any Whitecaps 2019 home contest by calling the Whitecaps front office at 616-784-4131 or by visiting www.whitecapsbaseball.com.